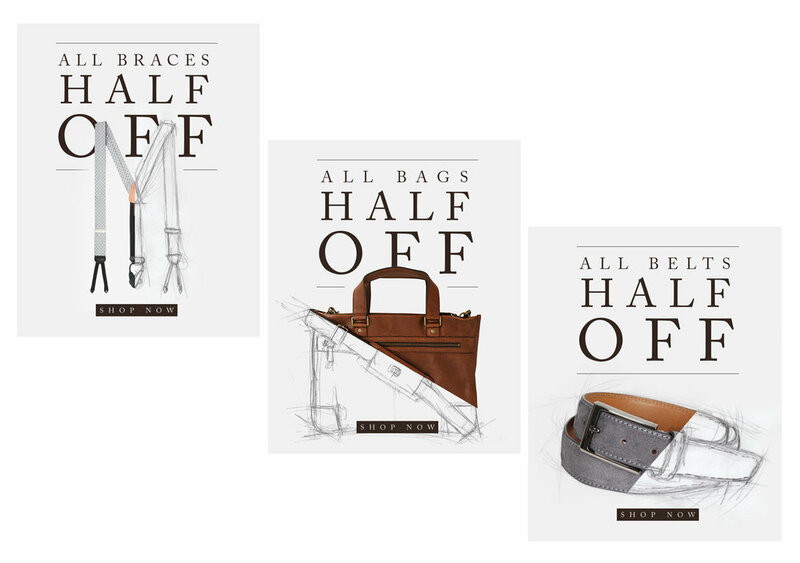 The series of emails below reflect a roll-out strategy for Trafalgar's leather goods. In a series of online promotions that launched over a span of 6 months, we conveyed the importance of purchasing the product as it will no longer exist. Product photography in combination of hand-drawn illustrations were used to further imply its disappearance. Email. Facebook. Combining elements of sophistication and fun, the identity below captures the spirit of its community and the charm of its predecessor. 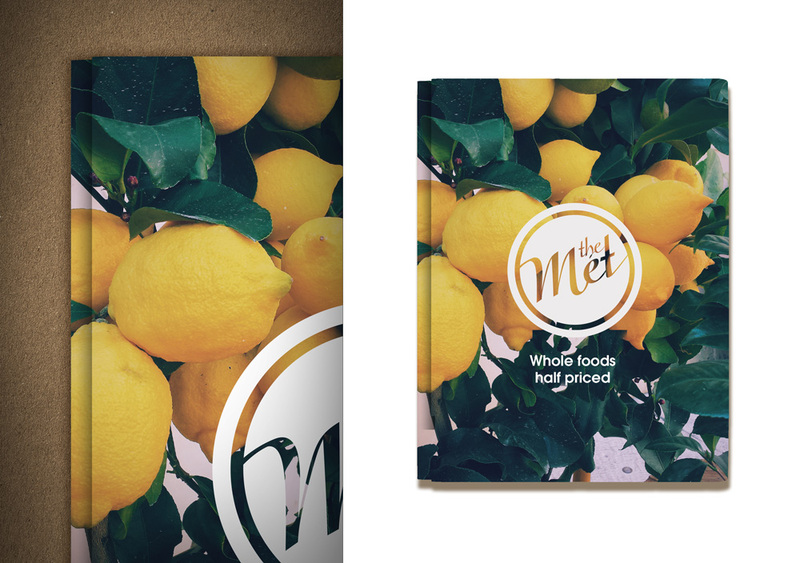 Its brand is altered yearly through representations of various fruits and vegetables in order to emphasize its authenticity as an organic and whole foods market. The launch below is the initial approach. This augmented reality poster serves as a promotional piece for Cambridge's new series, THiNK. 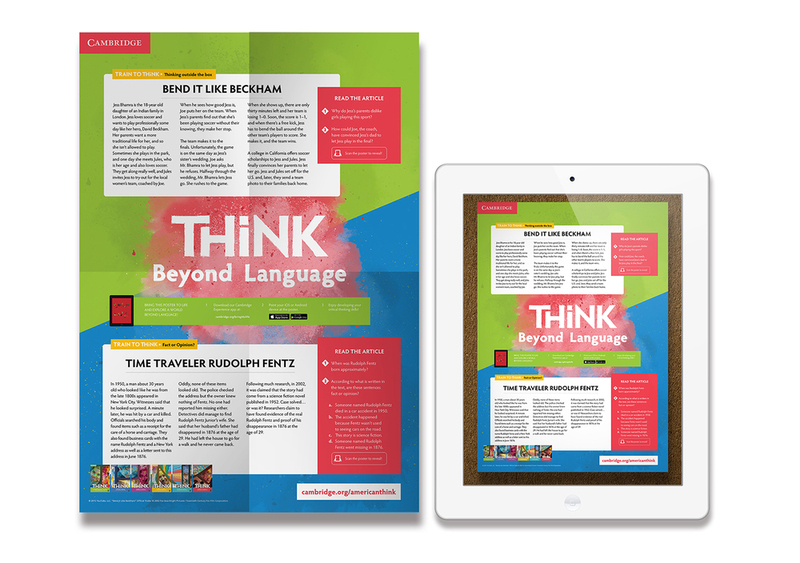 When this A4 poster is activated by a tablet or mobile device, it becomes an interactive experience for its viewer. 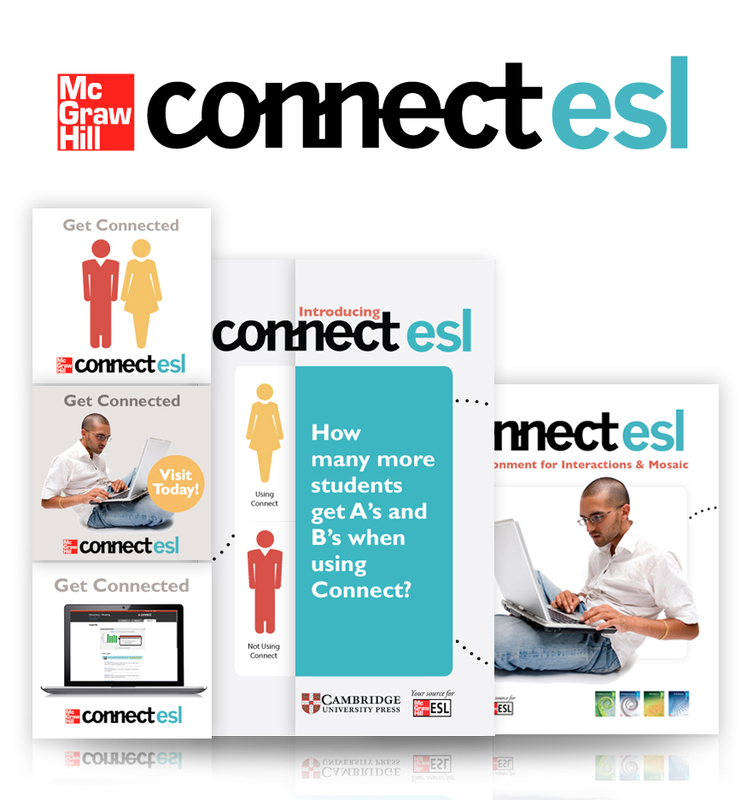 This piece acts as a lesson tool for ESL educators in the classroom. Collaborating with designers Alice Smith and Jeremy Vey from the United Kingdom, this poster successfully launched in 2016 as the first augmented reality piece for the series. 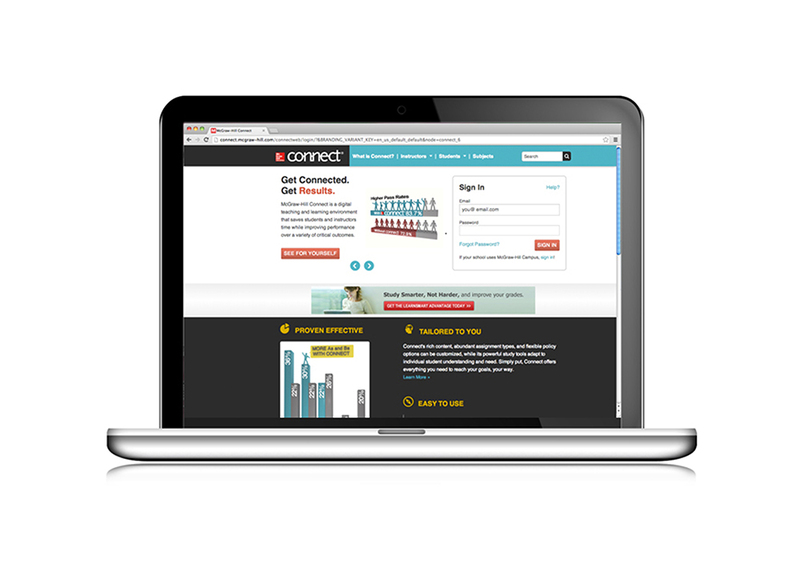 Under McGraw-Hill's request, the brochures below provide additional marketing support for its online platform, Connect. 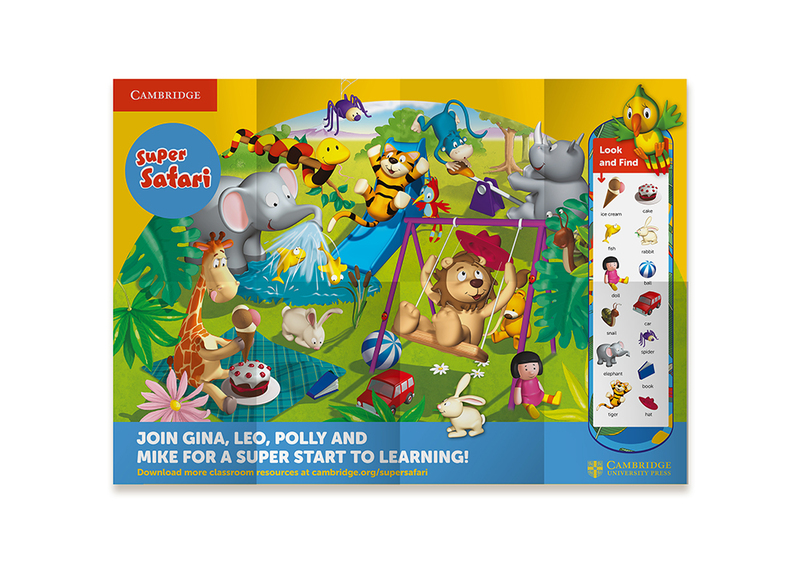 The Super Safari brochure serves as a promotional piece and lesson tool for instructors of the English language. 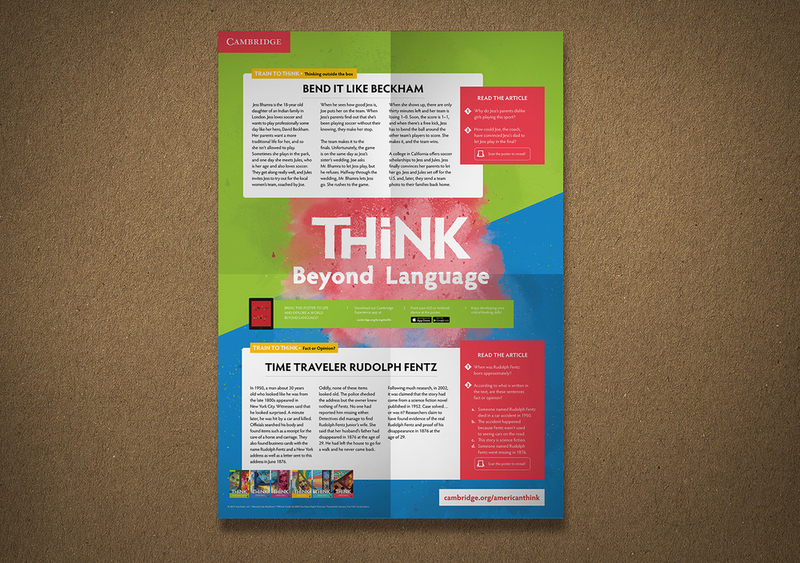 With a twist on the standard double-page spread, the piece below is an A4 brochure that transforms into an A1 poster. The poster, on its full side, serves its audience by providing them with a free activity for use in the classroom. 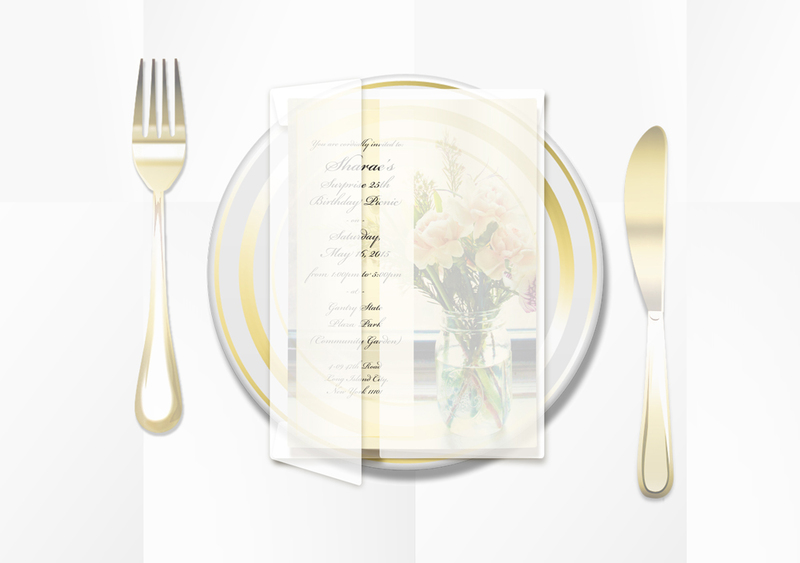 The invite below was created for a surprise birthday picnic at the Gantry Plaza State Park in New York. A special thanks to Pamela Gibbs for featuring this design on her blog, and to Vladimir Olivier for photographing the event. Designed single album cover for Nigerian rapper, Ladipo. "Gbe Si Le," which in English translation means 'put it down' is a very loose and rhythmic song expressing the desires of control and the subtlety of conquering one stage at a time. The color scheme places emphasis on the soothing rythm of the song. The album cover is also reflected on its simulated vinyl release. 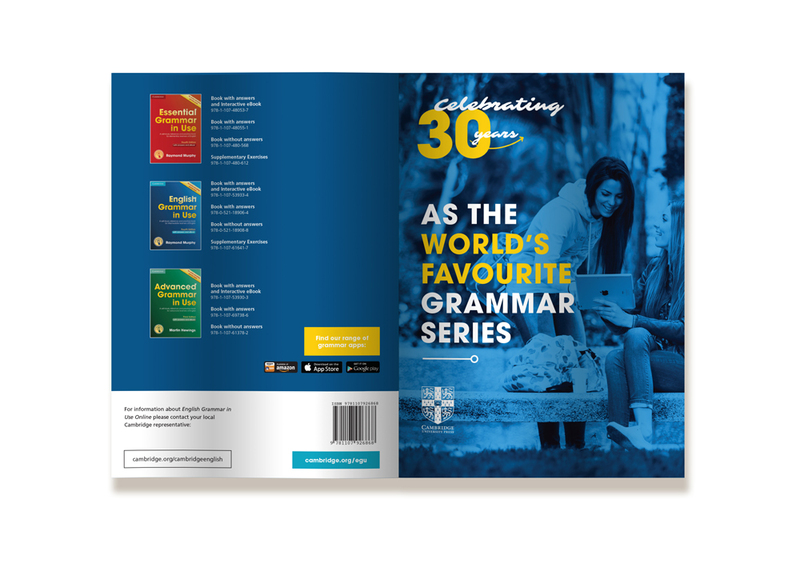 The English Grammar in Use brochure serves as a promotional piece in light of 30 years of service within English Language teaching. 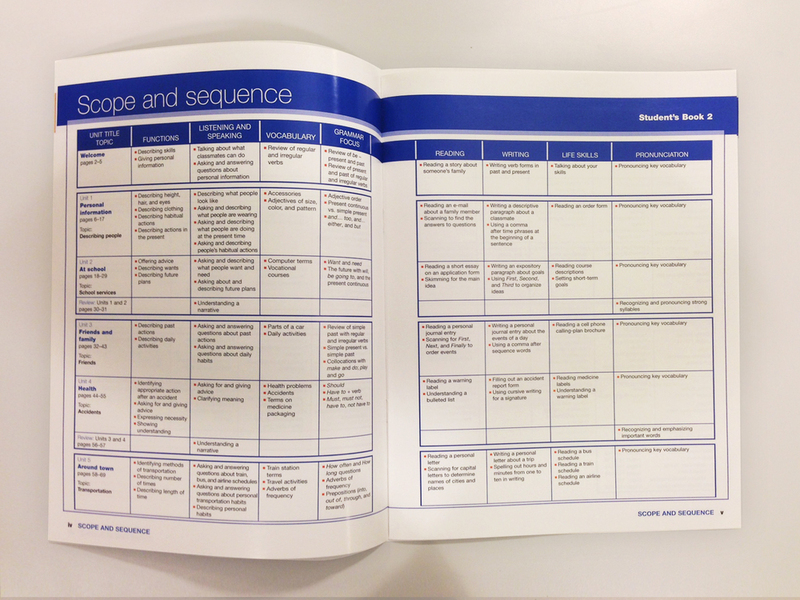 With a twist on the standard double-page spread, the piece below is an A4 brochure that transforms into an A1 poster featuring promotional product information and an irregular verbs chart. I have always been an advocate towards assisting those in need. Joining the New York Blood Drive (over a year ago) is just a small step towards me becoming a full time humanitarian. Out of the millions of attempts I've tried to encourage others to donate, I've only managed to persuade two. Literally, two. How can I encourage others who actually donate? This was the question I constantly asked myself as I developed the “If the shoe fits...” campaign. Scrolling through various social sites only enlightened me of the mindset of our youth who value articles of clothing above all else (even their own well being). Individuals who only care about their hair, nails and sneaker collection. It became apparent that most of us aren't aware (or care) about the environment/individuals who are fundamentally the reasons as to why shoes even exist! We are ultimately willing to disrespect, lie and steal from our fellow people, in order to gain objects of physical substantial value. If it not a matter of clothing as a necessity, its the brand of the clothing that is of most importance. So how can I encourage others who are more interested in fashion and materialistic values, to actually donate? One way I decided to go about this was to start from the ground up, in this case starting with shoes. Each shoe would represent individuals from different genders, personalities, status' , professions and interests to which quickly attracts a wide range of spectators. Attached to these shoes are stories–to which describe scenarios/events that leads up to the reasonings for donating. By doing this, I was able to shift the attention away from the product, to trigger an emotional response. After all, donating is way more serious than we would like to believe. Dealing with such a quick paced audience, this message had to be conveyed in the most simplistic and direct form of communication. We in New York, are no stranger to the floods of designs we encounter on a daily basis–our attention span to an ad/design is very shortened. These are the reasons for keeping design minimal, with one centered and bold image. The theme of red, white and blue is well maintained as it is intended for an American (New Yorker) audience. From posters to websites, and from attendance cards to e-mail campaigns, what you see here are the developments of an idea, and a simple concept/direction that hopefully one day an organization can explore. You see donating blood to me is a sacrifice, a gift, and a reward-all wrapped into one act. One very small act to which we should ALL be obligated to contribute (of course–if we all physically able). I sincerely believe that the more we help each other, the stronger we become....as a unit, as a society and as a human race. Visiting Aruba has undoubtedly broadened and shaped my limited perspective of the values and morals of another culture. In case you may not have known, I am an absolute stranger when it comes to traveling abroad. The fact is, I haven't. This entry will mark my first vacation (yes, at this late age) outside of the United States. 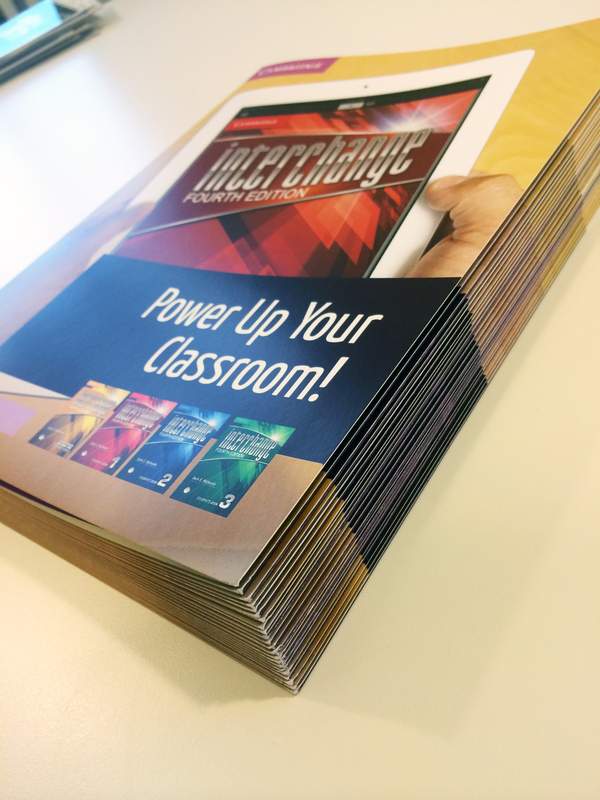 Many of you have seen my marketing campaign for the launch of Interchange Fourth Edition, and many of you have not. When a product launches, it is best to provide your audience with as much information as possible–in a diverse amount of ways (word of mouth, print, web, etc). But whose to say that your product begins and ends with launch material? Throughout ANY products existence, it is our role as marketers to develop alternative strategies to maintain customers interest. 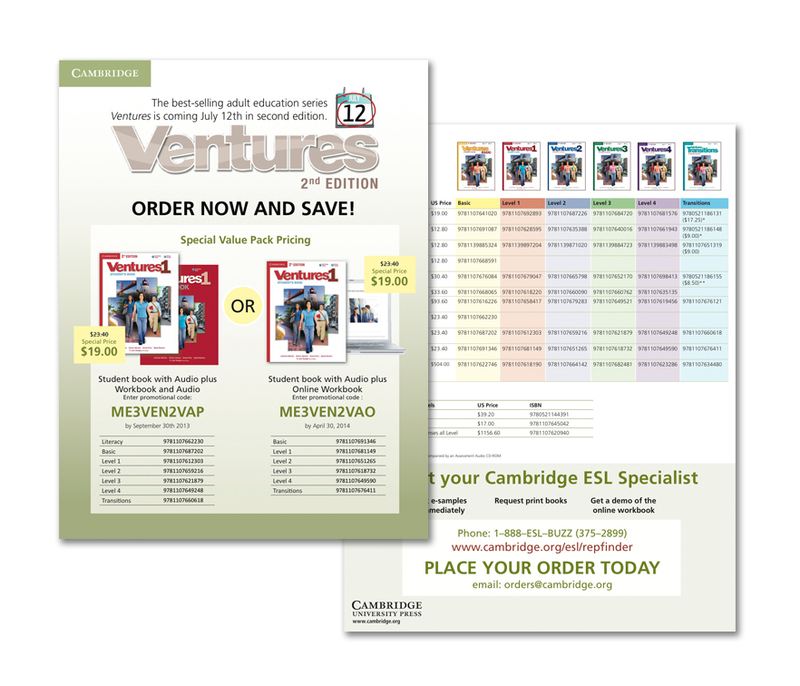 What you are seeing here is a continuation of marketing materials through print. 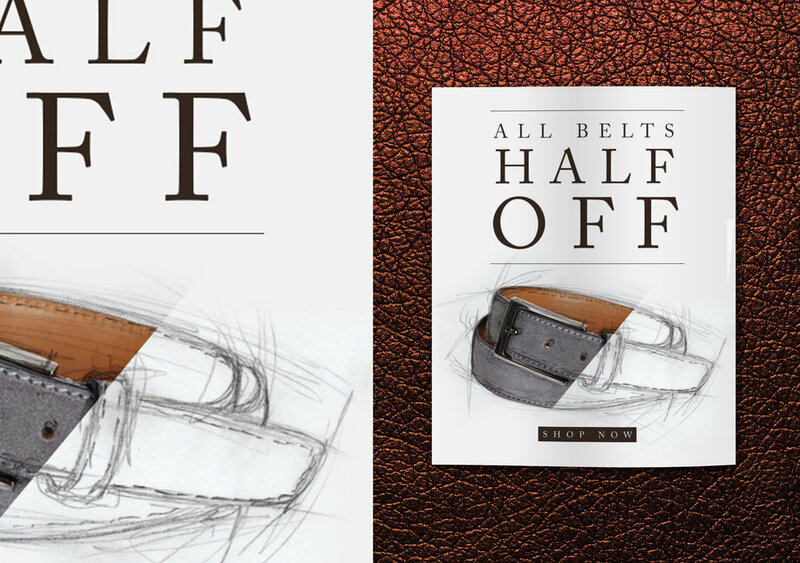 This brochure is the third one produced for the campaign, and has shifted apart from the basic saddle stitched piece. This is specifically designed for college professors–in order to freshen their knowledge of various components that Interchange offers. Have you noticed that within each designed piece, there is a consistent look and feel to it? Whether it may be the colors used throughout, the typography, the images, the grid structure, etc. ALL of what you see is practically the 'brand' of the product. This gives our product a unique look that is recognized throughout the world. If you're curious about the other side of this piece, or would like to see more... shoot me an e-mail. I will be happy to show you! It was around that time of year, folks. Yes, it was. It was HIS birthday and for the longest amount of time he mentioned how much he wanted a laptop. "I want this one. OH look Pam! That one is on sale! Wow 4 RAMS and a duel-processor!" Just about four months had passed since his first mention of a laptop and the thought lingered constantly within (Pam just get him the blasted laptop already). But when the time came, I simply did NOT have the funds. I mean of course it would've been an awesome present, but sometimes you have to choose an alternative route. If you personally know me, well-even if you don't: I am a very creative individual. Even when it comes to gifts, I seriously think about a present months ahead of time. In this particular scenario, I didn't want to get him an average laptop, I wanted it to be a great one. But once again, I did not have the funds. So I thought of other ways I could give him his laptop, but just not an actual one. At first I decided to bake a cake, then I was going to buy a small tablet, or perhaps settle and buy a used one... but with the days proceeding October 15th was right around the corner. What you see pictured here is the end result. Yes, I designed a card.. and why not?! I initially started with a logo similar to Hewlett-Packard's. 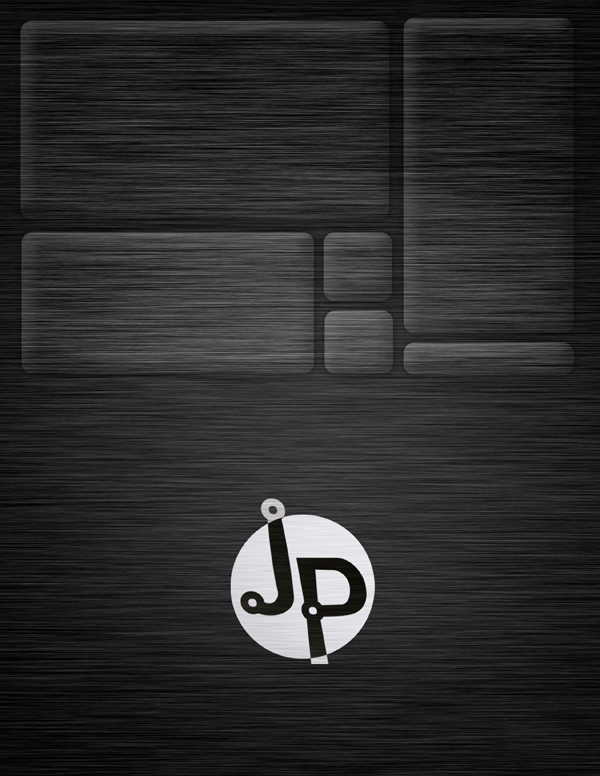 I thought it'd be cool to mix our names together and then scrambled for free metallic textures online. After that was of course implementation and design. 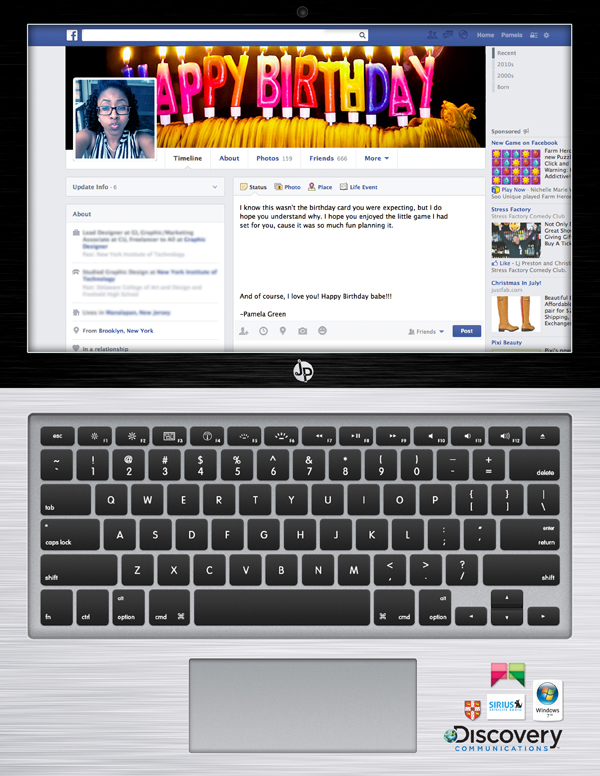 The keyboard, screenshots, pictures, etc. The little symbols you see are elements of our lives (companies we work for, what we like, his obsession with Facebook, etc). After that it was a matter of choosing the right card-stock and printing from home. Now I know this is not a typical entry, but not everything I design is for business.... sometimes its just the though that counts. I'm glad he loved it! "Polly Want a Cocktail?" 14"x17" Colored Pencil. 2005. I wanted to give some of you a more juvenile side of me. This illustration entitled, "Polly Want a Cocktail?" depicts a relaxed parrot enjoying his wine and crackers. As a teen I had a series of pets–rather birds: canaries zebra finches, parakeets, etc. My slight obsession with birds carried for many years until this day. They were my inspiration for this, along with household furniture and the need to tame my dozen canaries. This drawing hangs upon my mothers wall back home in New Jersey where it is recognized as one of my childhood achievements. I won 1st place in illustration (at the Hall of Records Art Show in 2005 in Freehold, NJ) with this piece. It was my second competition (since the 5th grade) I entered to win top prize. I do hope you have enjoyed your holidays... time seems to breeze on by with every passing year. Sigh* I just hope you all manage to make the most of every moment you breathe, and not live life to simply exist. As we all know, life is not about existing, its about making each day a memory. Sounds bogus and maybe a bit cliche("Each day Pam? That's impossible.") –but seriously, if you're not stepping outside of the box or doing something you've never done before at least every 2-4 months, you're not taking advantage of what this world has to offer. Just wanted to give you guys a sneak peak of some things I've been working on, and what to expect in the upcoming year. You'll be seeing some marketing materials I've designed for Discovery, as well as some freelance works (invitations, logos, website modifications, branding) and maybe some sketches. 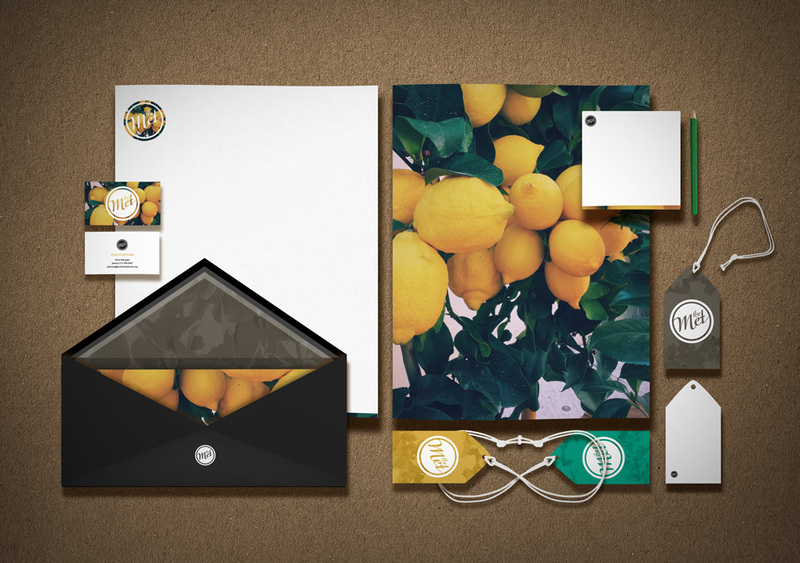 If these works do not make it on my portfolio page/homepage I'll be sure to post them here. Free of course, for you to comment a critique. With all else, take care! In one's design career, (in particular: mines) you may be approached with a lesser creative opportunity than you would hope. 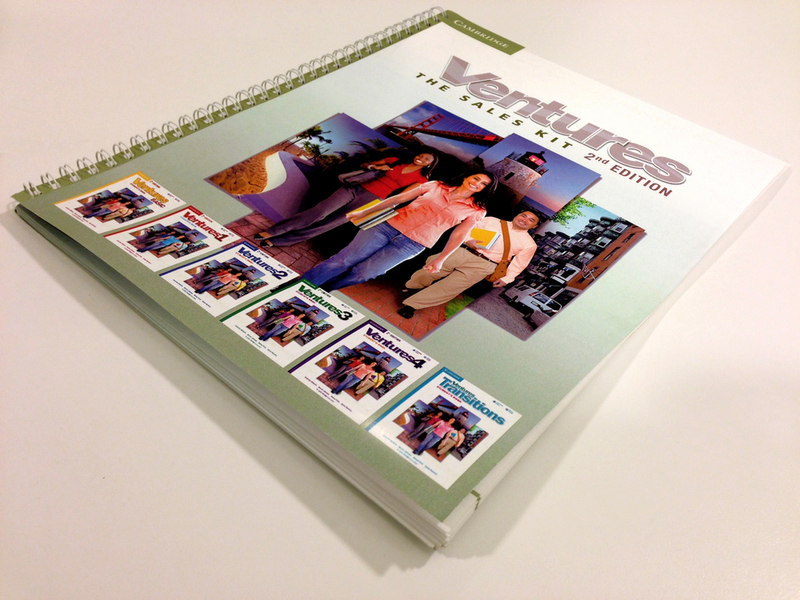 When I was presented with the product of Ventures, I was given an extremely tight deadline (a week design time) to produce various print collateral to promote the new 2nd Edition. 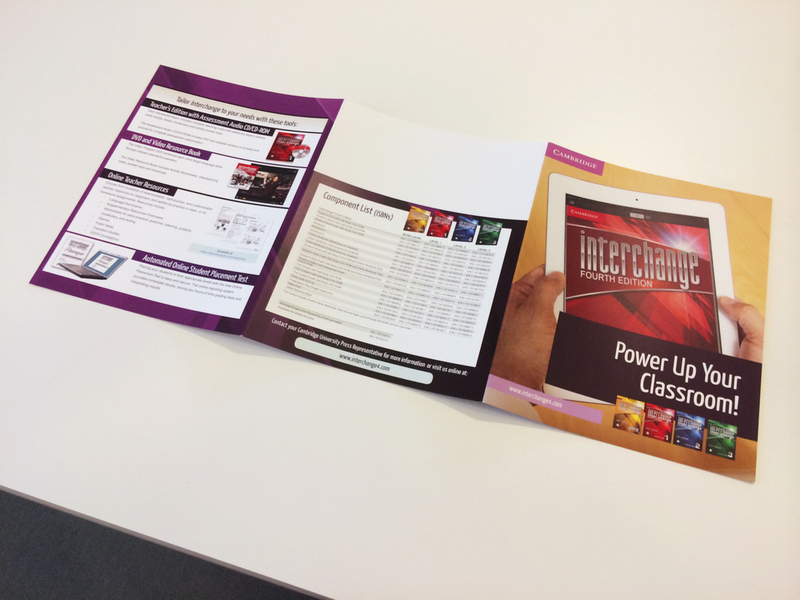 This included brochures, flyers, eblasts, teacher development correlations, sales kits, chapter walk-throughs, etc. Yes, all of what you see below were quickly mocked together, without branding resources. There was no time fully and comprehensively analyze competitive companies, or new approaches, let alone to present these various ideas to product/marketing managers, ( only for them to travel up the hierarchy of command to show them why your approach would be successful). What they needed was something NOW and something quick. Of course, there are upsides and downsides to working with assignments of this manner, the number one being quality. 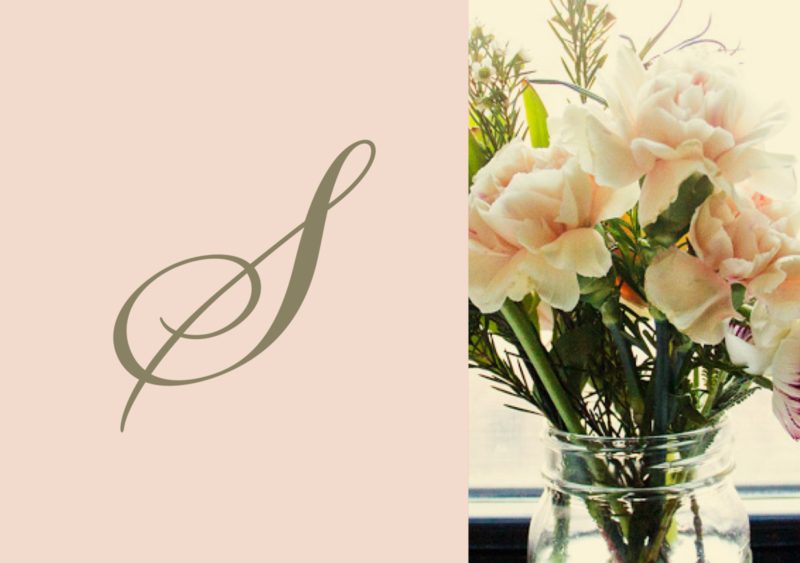 With appropriate time, a designer can develop beautifully crafted works. This of course, with TIME. When the option of quantity becomes priority, you WILL loose on other aspects of work as well. No way around it. As designers, as marketers we KNOW it is of most importance to maintain the integrity of your company. However, when placed in difficult situations you can only contribute what you have in a days time. As I look back at a these jobs 'well done' I can only look forward to the rebranding of these materials for a second shot, when there is sufficient time for research, practice and execution. This does not end nor begin with Ventures. Even as I look back at college assignments, previous works for clients I am at a constant, wanting to go back and tamper with alternate approaches. I can be my worst critique, but I believe thats what pushes me to design more constructively, and creatively as a designer. Overall, I appreciate your site. Love the layout, the about me and the sections... however, your work doesn't seem real. It looks staged. How can I believe it was you who designed this? 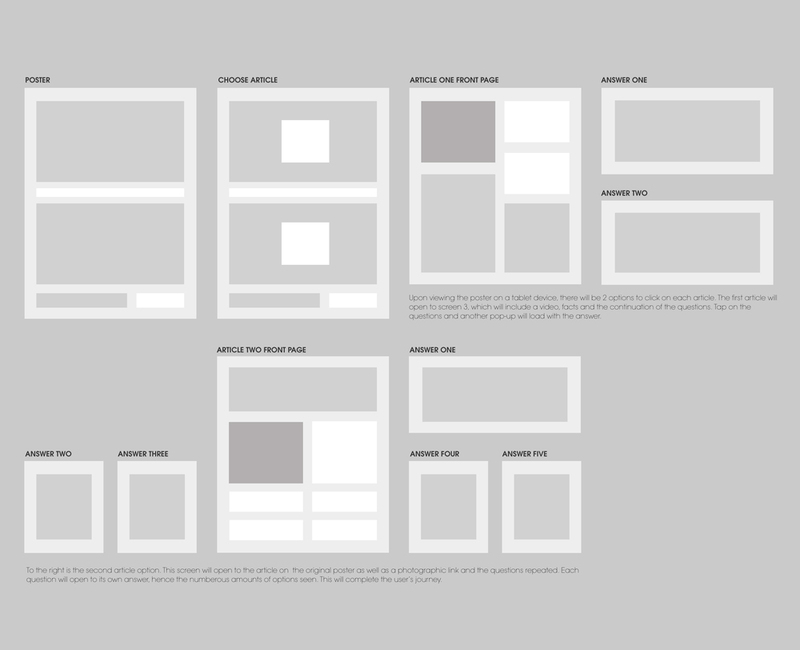 It actually took me quite sometime to decide a proper layout for all of my designs. I tried placing my works on different backgrounds (wooden tables, grass, on top of a kitchen sink) nothing seem to catch the neutral and simplistic look I aimed for. As you can see, a lot of my works have huge amounts of color, so it was best to use the white canvas of my site and push it further with images. I can assure you a lot of what you see are actual created pieces. However, for the outmost clearest display, I created the renderings you see from the original files. To balance this out I've combined these renderings with some photographs seen throughout. I have always believed that the work one produces should speak for itself. However, I do understand some of you would like to to know my process and how I went about designing certain works. I have included a brief description for all my works, also giving a gift ("What you get") to those of you who read. I will also update my blog from time to time and give an in-depth description of a selected piece from my site. Other than that, you can always contact me directly! You have a blog on here, which takes a lot of commitment, what will you do here to keep your audience interested? Having a blog on any website is a HUGE responsibility. As well as an other social networking tool. I have learned that updating must be frequent, however, if you love what you do... writing an entry here and there shouldn't cause much of a hassle. Fortunately I live in the Big Apple, so I am over saturated with design on a daily basis. I will be writing reviews of my works, giving critiques of designs I may come across, and sketch here and there. Also, as I am a developing designer, there are a lot of learned lessons, successes/failures that I have come across in my career. Possibly write about that as well. I thank everyone for the honest and constructive criticism, and believe me when I say ALL of you have been taken into consideration. If there's anyone else, pleases do not hesitate to comment below or send me an email at pam@pamgreendesigns.com I look forward to hearing from you!